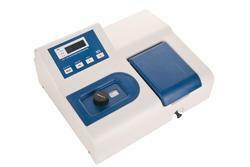 We are offering Digital Spectrophotometer. Range 340-960 nm with facility for automatic concentration, % Transmission and absorbance measurements. Wavelength resolution 5nm, 3½ digit LED display with a set of 10 test tubes. Microprocessor Visible Spectrophotometer offered features single beam, grating 1200 lines/mm optical system that comes with the spectral bandwidth of 5 nm, the wavelength range of 325 ~ 1000 nm and wavelength accuracy of + 2.0 nm. These advanced technology based spectrophotometers also feature wavelength reproducibility of 1 nm, the photometric accuracy of + % T, photometric reproducibility of < 0.5 % T, Tungsten – halogen lamp 6V/10Wbased light source and 4 LED digital display support. Offering stable & accurate functionality support, these deliver high VIS performance between 325 to 1000 nm and RS232C communication support. For End Point, Kinetic, Fix Point, Multi Standard and coagulation tests. Quartz flowcell system. 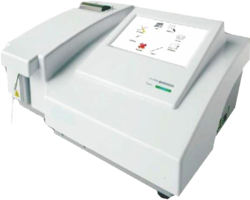 Built in Thermal printer with graphics capability. In order to keep pace with the never ending demands of customers, we are involved into offering wide range of Digital Spectrophotometer.